Jenny Talks: I Love my Twittermates! 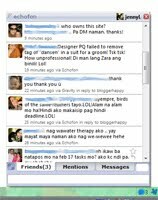 My co digi-scrappers and I used to talk about anything digi-scrapping and more at our forum before but when all of us got a twitter account then that where we talk everyday. We can talk about anything under the sun: be it digi-scrapping, parenting, health issues, work, tutorials, travel, gadgets, iphone 3gs cases, shopping and whole lot more. Our private witter also serves as our place to vent out and ask for prayers if you need some. It's a support group and I'm so thankful that I found these ladies that keeps me company all the time. I never imagined I'll be tweeting to the max since 2008 and thanks to Twitter for it's our private haven of sort.